When she was in 4th grade, Allie Boyer started Purses for Primates, an organization that raises money for the care, protection, and rehabilitation of displaced, injured, and orphaned orangutans. Now a high school senior and a member of the Roots & Shoots U.S. National Youth Leadership Council, Allie continues to raise awareness about deforestation and the impacts of palm oil production on biodiversity. Since it’s inception, Purses for Primates has raised over $27,000. On Friday, April 22 (Earth Day!) 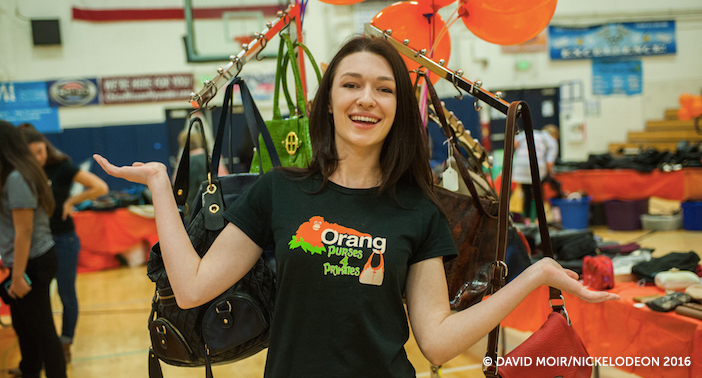 Allie and her Purses for Primates group were featured on Nickelodeon’s The Halo Effect. The cameras followed the group as they took on Allie’s biggest fundraising goal yet. The team collected 2,000 purses and over $3,000 to donate to two baby orangutans that were recently rescued by Orangutan Outreach. Friday’s feature proved that Allie is a strong role model for young people — she hopes she can be an inspiration to youth all over the world. We checked in with Allie before her big television debut. Roots & Shoots: How did you first become interested in conservation and orangutans? Allie: I first became interested in primates in second grade after reading about Koko’s kitten. I then proceeded to look up videos of primates (orangutans) and realized how intelligent there are. I wanted to help save them and took action by starting a community outreach program at school and worked to get other kids involved. R&S: How has Roots & Shoots helped your organization? How did you first get involved with Roots & Shoots? A: I started a club in 4th grade and joined the council (Roots & Shoots U.S. National Youth Leadership Council) my freshman year of high school. I was able to meet so many people through the council that helped inspire me. Amanda Ketterer (and her ChimpAid campaign) was a big influence. I always felt that the other youth leaders were very helpful and offered advice and it was nice to be able to talk to people my own age about their work and experiences. R&S: How do you hope to inspire other teens? A: I really hope that kids can see the Nickelodeon episode and be inspired to start their own Purses for Primates groups. A: It feels amazing to see that my hard work has been able to produce positive impacts in orangutan conservation. I hope to continue to support orangutans in rescue centers for years to come! R&S: How has Dr. Jane inspired you? A: I loved reading Jane’s story of working hard to be where she wanted to be and how her passion drove her work. R&S: What are your goals for the future of Purses for Primates? A: My ultimate goal is to have one sister group in each state. Beyond that I hope to one day have an online store. R&S: What are your future plans for school? What do you plan on studying? A: I recently submitted my confirmation for Chico State where I hope to study business or anthropology. R&S: How can someone donate their purses to you? A: If you are local to Chico the group can do pick-ups. If you are not local you can mail to items to P.O. Box 6153 Chico, California, 95927. Allie is available to speak to your school or organization! For more information about Purses for Primates or to invite Allie to speak, click here. To watch Allie’s episode of The Halo Effect, click here. Elyse is an Intern with Roots & Shoots at the Jane Goodall Institute. She assists the Roots & Shoots team with ongoing projects and works closely with the U.S. National Youth Leadership Council bloggers. Elyse is a graduate student at the University of Maryland working on her Masters in Environmental Policy. She has been with the Jane Goodall Institute since February and continues to work to make a positive change in her community — for people, animals and the environment.